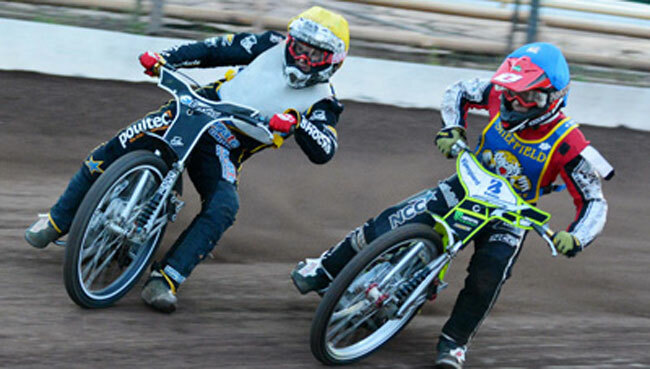 A solid Kings Lynn Lightning team ran out comfortable winners in last Thursdays MDL clash against the Tiger Cubs but the racing on show was far better than the scoreline suggests. Tiger Cubs Alex Wilson (pictured battling with Layne Cupitt) and Tom Bacon put up a spirited display and put the Lightning riders under considerable pressure in all their rides. For the visitors, Andy Blackburn used his wealth of experience of the Owlerton track to record a paid maximum with some very good overtaking manoeuvres along the way. He was joined on a paid maximum by the impressive Adam Portwood while Layne Cupitt was unlucky not to chalk up another full maximum at Sheffield when he slid off whilst leading Heat 1.